The Edmonton Convention Centre recently welcomed 8,000 new friends to its venue. In conjunction with the City of Edmonton’s Urban Beekeeping program, a hive of bees was placed on the south east portion of our grounds, complementing the surrounding sustainable permaculture. With bees comes honey! The hive will potentially become a home for up to 70,000 bees, allowing us to harvest our own honey and introduce it into our culinary operations. To celebrate the arrival of our new winged friends, Executive Chef Simon Smotkowicz has shared a honey inspired recipe. On a lightly floured surface, roll puff pastry into an 18-inch/46-centimeter square. Starting with the edge closest to you, tightly roll the dough into a log. Wrap in plastic wrap and refrigerate until very firm, at least 30 minutes and preferably overnight. Heat the oven to 500 degrees and arrange the oven racks in the top third and lower third of the oven. Place 2 cookie sheets on the oven racks while the oven heats. In a medium saucepan, make honey syrup by combining Alberta honey, cinnamon stick and 2/3 cup/165 milliliters water. Bring to a boil and cook 1 minute. Turn off heat and let stand until you’re ready to use it. Using a rolling pin, roll one of the pastry rounds into a 2 1/2-inch/63-millimeter circle. 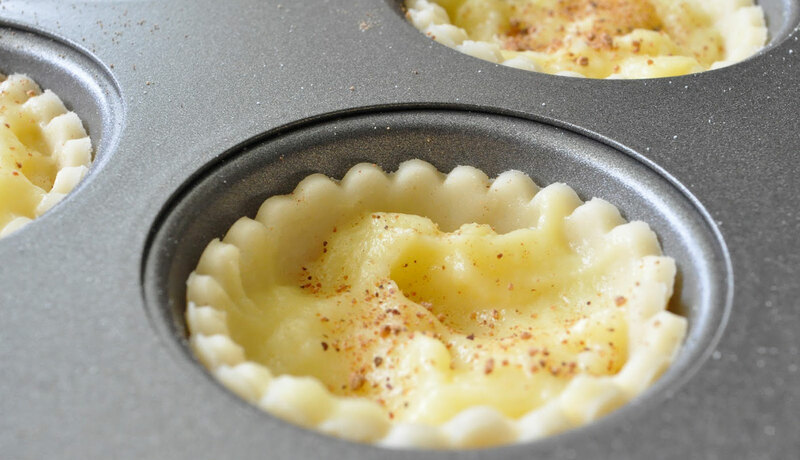 Place pastry into the cavity of a mini-muffin tin, and press to evenly flatten the dough against the bottom and sides of the cavity, extending about 1/16 inch/3 millimeters above the rim of the pan. The dough should be about 1/16 inch/3 millimeters thick, with the bottom a bit thicker than the sides. Repeat with the remaining dough, chilling the cut rounds if dough becomes difficult to roll. Refrigerate crusts until firm, at least 10 minutes. While the dough chills, finish the filling: In a small saucepan, heat 1 cup plus 1 tablespoon/255 milliliters milk over medium-low heat until bubbles begin to form around the edges. In a large bowl, whisk flour with the remaining 5 tablespoons/75 milliliters milk. Continue whisking while adding the hot milk in a slow, steady stream. Discard the cinnamon stick from the honey syrup and whisk the syrup into the milk mixture in a steady stream. Return to the saucepan and cook over medium-low heat, whisking constantly, until thickened, 5 to 10 minutes. Place the yolks in a large bowl. Whisking constantly, add hot milk mixture to eggs in a slow stream until fully incorporated. Strain through a fine-mesh sieve. Pour warm filling into pastry shells until they’re three-quarters full. Transfer tarts to the cookie sheets in oven and bake until the shells are golden brown and crisp, and the custards are golden brown and darkened in spots, 15 to 19 minutes. Let cool in the pans on a wire rack for 5 minutes and then pop out tarts to continue cooling on the racks for another 5 minutes. Sprinkle with cinnamon and serve warm.